2) Obtain a listing of forward dividend payments at the end of the month, and make a comparison to determine if any changes occurred in the meantime. You can see that this is a somewhat manual process. However, it is helpful for me, since I rely on dividend champions so much in general. The October 2018 Dividend Champions list can be downloaded as Google Drive Document or a Dropbox Document. Brady Corporation (BRC) raised its quarterly dividend by 2.40% to 21.25 cents/share. 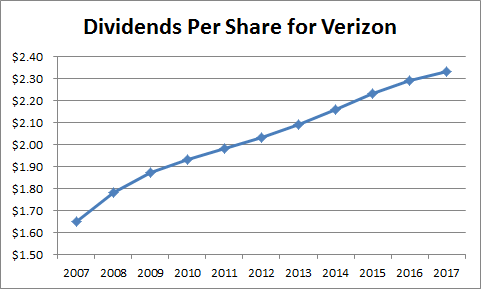 This marked the 33rd consecutive annual dividend increase for the dividend champion. McDonald’s (MCD) hiked its quarterly dividend by 14.90% to $1.16/share. This was the 43rd consecutive annual dividend increase for McDonald’s. I also updated the record for West Pharmaceutical Services (WST) to 26 years of annual dividend increases. The increase was announced in May 2018 together with the regular dividend payment. The new quarterly dividend of 15 cents/share is 7.10% higher than the previous amount of 14 cents/share. There were no dividend cuts. However, one company is probably going to lose its dividend champion status at the end of the year, if it doesn’t raise dividends. Tenant Company (TNC) is in jeopardy of being removed from the list of dividend champions, since it hasn’t raised distributions since 2016. Another company will be acquired in the first quarter of 2019, so I need to take it off the list then. This is utility Vectren (VVC), which had a 58 year streak of annual dividend increases. We have discussed before how dividend growth stocks make great acquisitions. I have found however that as a dividend investor, I would usually be in a better spot if the stock I owned was never acquired in the first place. In the process of reviewing dividend histories and dividend increases, I have repeatedly stumbled upon a few companies with long histories of dividend increases that weren’t on the dividend champions list. After reviewing the dividend histories, I have decided to promote the following company into this elite list. Abbott Laboratories (ABT) has increased dividends for 46 years in a row. The messy part about Abbott is that in early 2013, it split into Abbott Laboratories and Abbvie (ABBV). 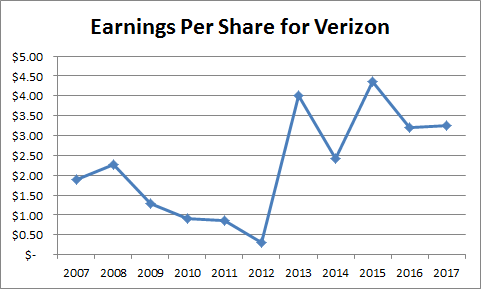 Since the split, both companies have managed to raise their dividends annually. Standard & Poor’s has both companies with the same track record of annual dividend increases, while the late Dave Fish had their track record at 5 years. The company that will keep the dividend increase record will be Abbott Laboratories, since Abbvie is a spin-off that doesn’t keep the legacy name. This is a similar situation to what happened with Altria (MO) in 2007 and 2008, after it spun-off Kraft and Phillip Morris International. Altria gets to keep the dividend record from before, while Kraft and PMI had to build theirs from scratch. I decided to demote Realty Income, since it has only raised dividends for 24 years in a row. Realty income (O) raised its monthly dividend from 22 to 22.05 cents/share. The company will be eligible for inclusion after its first dividend increase in 2019 however. I still like the REIT, and would love it even more at lower entry prices. This leaves us with 124 Dividend Champions for October 2018. 3M Company (MMM) operates as a diversified technology company worldwide, which operates in five segments: Industrial, Safety and Graphics, Health Care, Electronics and Energy, and Consumer segments. 3M is a dividend king with a 60 year record of annual dividend increases. The company raised its quarterly dividend by 15.70% to $1.36/share in January 2018. This increase reflects 3M's confidence in its ability to continue generating premium returns in 2018 and beyond. Over the past decade this dividend growth stock has delivered an annualized total return of 14.40% to its shareholders. Future returns will be dependent on growth in earnings and starting dividend yields obtained by shareholders. The company has managed to deliver a 3.50% average increase in annual EPS over the past decade. 3M is expected to earn $10.33 per share in 2018 and $11.19 per share in 2019. In comparison, the company earned $7.93/share in 2017. 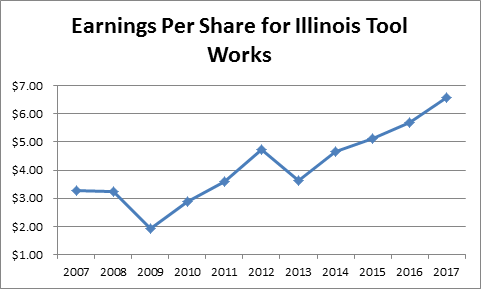 If we adjust for the $1.24 one-time item, related to the new tax laws implemented in 2017 however, earnings per share would have been $9.17. The strength of 3M’s business model is largely driven by three key strategic levers: active portfolio management, investing in innovation, and business transformation. Management believes that these levers, combined with more aggressive capital deployment, will drive enhanced value creation. Over the last several years 3M has taken significant actions to strengthen its technology capabilities, improve portfolio and cost structure, and make the company even more relevant to customers. 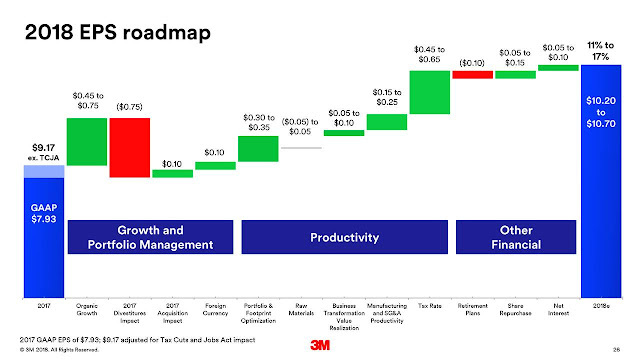 3M’s technology platforms and its manufacturing scale allow it to achieve the lowest unit cost in most of the categories in which 3M competes. This also ensures high margins as well. The first lever – Portfolio Management – is increasing customer relevance and allowing 3M to focus on its most profitable and fastest-growing businesses. 3M has realigned from 40 businesses to 24 over the past five years. This has resulted in SG&A savings of around $250 million. Continued portfolio management will also help to optimize its footprint, and the company is targeting $125 million to $175 million in additional operational savings by 2020. The company is also expecting that acquisitions, net of divestitures will result in a net 1% growth in annual sales over time. Portfolio management is strengthening 3M’s competitiveness and making them even more relevant to our customers and the marketplace. Investing in Innovation is the second lever. 3M plans to increase investments in research and development to about 6 percent of sales. The company spends over 6% of revenues on R&D, and has been able to discover innovative products to bolster its bottom line. 3M also allows it engineers to spend 15% of their time on their own projects, which has resulted in a lot of innovation. The company has a proven track record of making money on its research dollars spent, as it tries to find applications with a customer centric point of view. The company invests in research and development to support organic growth, and enhance the company’s strong margins and return on invested capital. 3M continues to make good progress on its third lever – Business Transformation – which is enabling the company to better serve customers with even more agility and efficiency. Its Business Transformation lever aims to creating value for the company and its customers. By 2020, this initiative is expected to deliver $500 to $700 million in annual operational savings, and an additional $500 million reduction in working capital. The company is also focusing on investments in priority growth platforms such as auto electrification, air quality and personal safety. The company is also focusing investments on its strong global business model including in the U.S. and China. The company provided a rough roadmap of how it plans to get from the $9.17/share earned in 2017 to the earnings expected in 2018. I believe that a picture is worth a thousand words in this case. Earnings per share have also been aided by share buybacks. 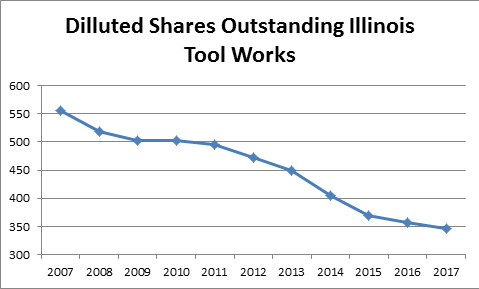 The number of shares outstanding has decreased from 732 million in 2007 to 613 million by 2017. The annual dividend payment has increased by 9.40% per year over the past decade, which is higher than the growth in EPS. Future rates of growth in dividends will be limited to the rate of growth in earnings per share. For more than a century the strings of 3M business model has enabled the company to invest in the business while also returning cash to our shareholders. All of this has included a strong steady and rising dividend which is management sees as the hallmark of the enterprise. 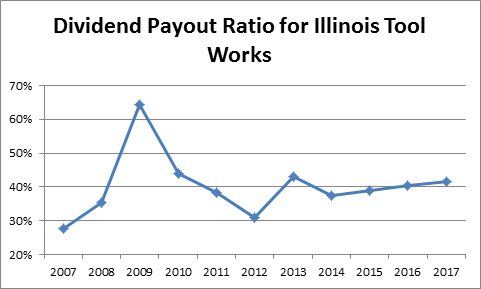 In the past decade, the dividend payout ratio has increased from 34% in 2007 to 59% in 2017. I believe that 3M's dividend is safe. A lower payout is always a plus, since it leaves room for consistent dividend growth minimizing the impact of short-term fluctuations in earnings. Currently, 3M is slightly overvalued at 20.40 times forward earnings and has a current yield of 2.60%. This quality company may be worth a second look on further dips in the stock price below $206/share. More conservative investors who are using FY 2017 earnings per share may require dips below $183/share before considering 3M. A common question I have received from readers has to deal with finding quality dividend growth stocks that are not US based. If you follow financial markets, you may have seen that foreign stocks have gone nowhere for a decade, while US stocks have increased in value. In addition, the overall valuations on foreign companies seem to be lower than overall valuations on US stocks. After some additional research however, it seems that the differences in overall valuation has more to do with the different sector composition of foreign stock indices versus the sector composition of the US stock market. For example, foreign consumer staples companies like Diageo (DEO) and Unilever (UL) are just as expensive as their US counterparts. For readers who are willing to do a little bit more research, there is the possibility to uncover hidden dividend gems abroad, which are under-followed and possibly undervalued. There are several lists of foreign dividend growth stocks that can be used in your research. There is an ETF that tracks the index, which is from Vanguard (VIGI). You can also download a list of all holdings from this google document. There are few other sites, which focused on the international dividend growth stocks. These lists provide a lot of information on those securities, including annual dividend increases, dividend history and valuation. There is a list of UK Dividend Champions, updated monthly. After going through some of the lists outlined here however, I saw quite a few companies that I have never heard of before. Just as I mentioned in a previous article, there are some risks to consider with international companies. Notably, their dividends are paid in foreign currencies, which means that the dividend income in US dollars will fluctuate in the short term. In addition, those dividends may be subject to withholding taxes at the source, which may result in extra paperwork for you each year. This means that you should be careful before placing foreign stocks in retirement accounts, because your dividends can be taxed. The exceptions include British and Canadian stocks. Another thing to consider includes the fact that many of the foreign dividend stocks I have considered and owned in the past have tended to be global multinationals with operations around the world. Of course, the most challenging factor in researching international companies involves the difficulties in finding information in different languages and even accessing international stock markets directly, which could be costlier. International companies are not as accessible for research like the US companies. I find that owning US stocks is better in those situations, since most dividend growth stocks I focus on already have vast global operations.